Distribution & habitat: Adiantum capillus-veneris is a species of ferns in the genus Adiantum with a subcosmopolitan worldwide distribution. Adiantum capillus-veneris is native to the southern half of the United States from California to the Atlantic coast, through Mexico and Central America, to South America. It is also native to Eurasia, the Levant in Western Asia, and Australasia. Adiantum capillus-veneris is found in temperate climates from warm-temperate to tropical, where the moisture content is high but not saturating, in the moist, well-drained sand, loam or limestone. 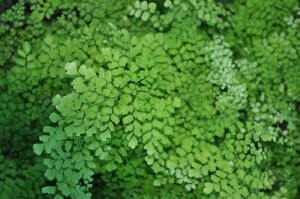 Habitats of the Adiantum capillus-veneris includes rainforests, shrub and woodlands, broadleaf and coniferous forests, and desert cliff seeps and springs. Adiantum capillus-veneris typically grows on rock faces and in crevices of cliffs, on banks and ledges along streams and rivers, or close to natural hot springs. It is cultivated as a popular garden fern and houseplant. Description: Adiantum capillus-veneris has roughly triangular light green fronds comprising many delicate-looking, fan-shaped leaflets. In particularly fine specimens the fronds may be up to 60cm (24 inch) long and 25cm (10 inch) wide with individual leaflets 2-3cm (1 inch) across, but the average plant will be somewhat smaller. With pale green new growth this fern is excellent for glasshouse or indoor use. 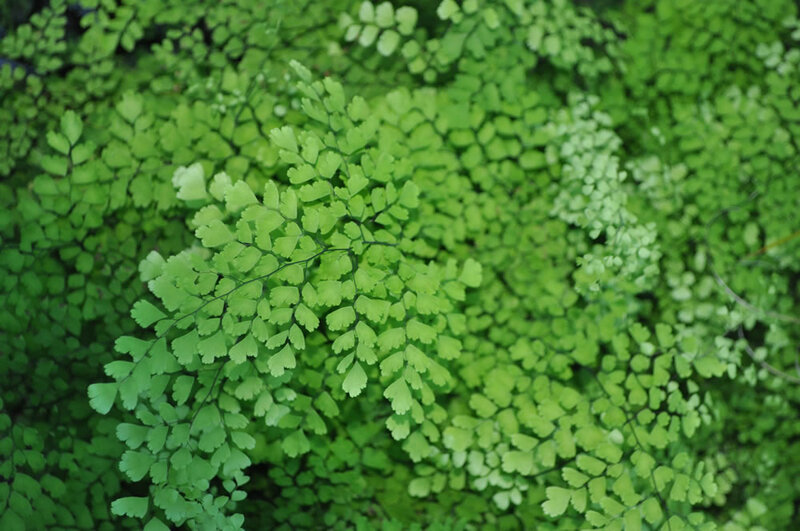 Houseplant care: Adiantum capillus-veneris requires humid conditions, and air movement, but will not tolerate hot, dry winds. Temperature: Adiantum capillus-veneris will grow well in any normal room temperature and can tolerate temperatures down to 10oC (50oF). If the temperature rise above 24oC (75oF), stand pots on trays of moist pebbles and moist daily to provide much needed humidity. Watering: Adiantum capillus-veneris require regular watering in the summer months but with less in winter months when the growth is slow or possibly absent. Avoid wetting the foliage, water by raising the fronds with the back of the hand and watering the underneath parts of the plant. Standing pots on pebbles in a saucer of water helps to increase the humidity. Soil: Moist soil but well drained. Ideally light, loamy and neutral to alkaline. A soil mix consisting of 2 parts peat moss to 1 part loam to 2 parts sand is recommended, with 2 tablespoons of ground limestone (for every 15cm (6 inch) pot) added to change the pH. This is favorable as the plant’s native habitat is on moist maritime/limestone cliffs and boulders. Fertilise: From spring to autumn, Adiantum capillus-veneris benefit from fertilising in small doses at half-strength fortnightly or monthly. Fish emulsion, seaweed extracts, liquid cow manure are all good fertilisers. Slow release fertilisers can be added to the potting mix. Fertilise only when the soil is moist. Potting and Repotting: Adiantum capillus-veneris grow best in a well drained open good quality potting mix containing humus such as cow manure, tree fern fibre, leaf mould, peat moss or perlite to improve the water holding capacity. A small amount of lime or dolomite is beneficial. Adiantum capillus-veneris are better underpotted than over-potted and usually only need repotting each year or two and this is best done in the spring months, that is, the beginning of the growing season. Propagation: Adiantum capillus-veneris can be easily propagated by dividing its underground rhizome. Firstly, trim off to almost ground level most of the older rachis and remove withered fronds. Then dig it up and divide by cutting through with a garden spade or sharp long-edged knife and finally replant the divisions into individual pots, being careful not to plant their crown below soil level, as it is from this point that new fronds will emerge. Adiantum capillus-veneris can also be propagated from spores. Collect the ripe spores from under spore-bearing pinnules (leaflets) and sow on the surface of a humus-rich sterilized soil. Keep the growing medium always moist by covering with a plastic bag over the pot. Germination should take place within 6 weeks at a temperature of 20-21oC (68-70oF), then transplant the tiny clumps of plantlets where desired. This fern has therapeutic benefits too – as a diuretic, expectorant for respiratory problems, treatment for dandruff, hair loss and menstrual disorders among others. Problems: No serious insect or disease problems. Leaves may scorch in direct sun. Fronds will die back quickly if soils are allowed to dry out. Pests: Susceptible to snails and slugs.